Colorful pennants whipped in the breeze Thursday afternoon atop yachts that are part of the New York Yacht Club's summer cruise to Maine. Nearly 70 sailing and motor yachts filled Belfast Harbor for the event, which included a lobster bake for 250 people at Front Street Shipyard. The harbor was bustling Thursday as the sailors and crew disembarked from nearly 70 vessels that are part of the New York Yacht Club and took to the streets of Belfast for sightseeing and shopping. It was the yacht club's first-ever cruise in Belfast. 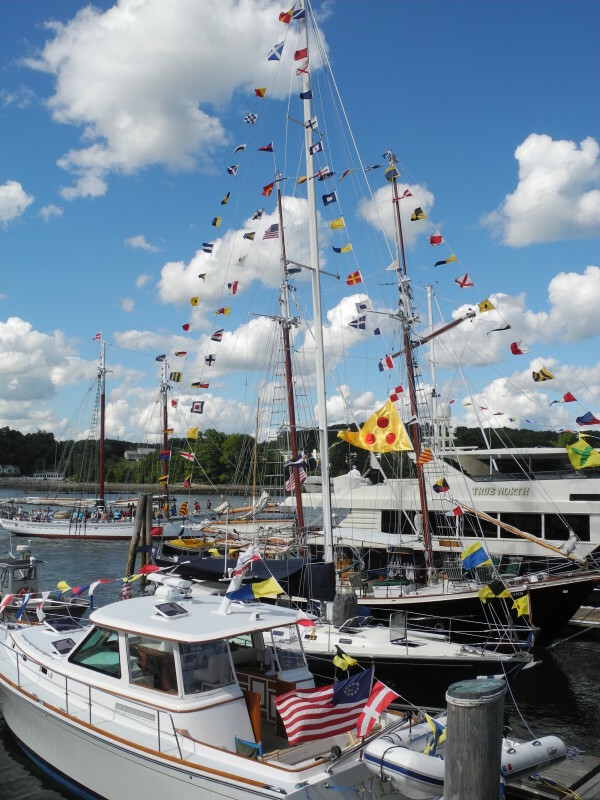 BELFAST, Maine — Jaunty, fluttering pennants and beautiful multi-million-dollar vessels filled Belfast Harbor Thursday as the New York Yacht Club made its first-ever visit to the midcoast city. Nearly 70 boats had arrived by Wednesday evening and found their berths and moorings for their stay in Belfast, scheduled to last until Friday. 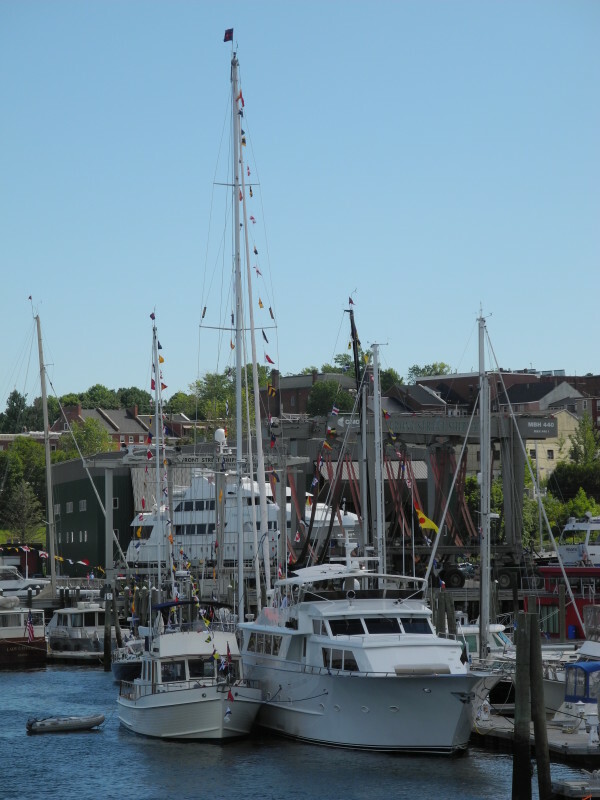 Every year, the yacht club members go on a cruise and every other year they come to Maine, according to Caitlin Strunk, the dockmaster for Front Street Shipyard. Her company is hosting the floating party’s midcoast visit. One of the planned events was a Thursday night lobster bake for 250 people, held in one of the shipyard’s large green buildings. But during the day, the participants didn’t have any races or sailing obligations. Some sailors took advantage of the free day to stroll around town, including Louise Clark, who had just gone shopping for food at the Belfast Co-op. She said she was flown in from her home in the south of France to work as a crewmember on the 60-foot catamaran Flow during the annual cruise, which started in Newport, Rhode Island. According to Clark, the yacht club’s cruise is a lot of fun. The boats in the harbor ranged in size from a 31-foot sailboat to a 118-foot yacht, Strunk said. They are scheduled to sail away Friday and the next stop is Islesboro. But all day Thursday the boats — and the visitors — did not go unnoticed by locals. “How wonderful it is to see so many New York visitors in Belfast and our harbor filled with beautiful boats,” Karen Brezsnyak, the executive director of the Belfast Area Chamber of Commerce, said.